Ford just released its monthly auto sales numbers for June, and the results showed a modest increase of 1.2%. 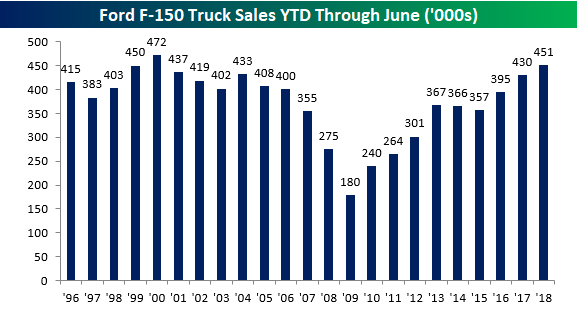 As we do each month, our focus in this report is truck sales and more specifically F-series pickup trucks. 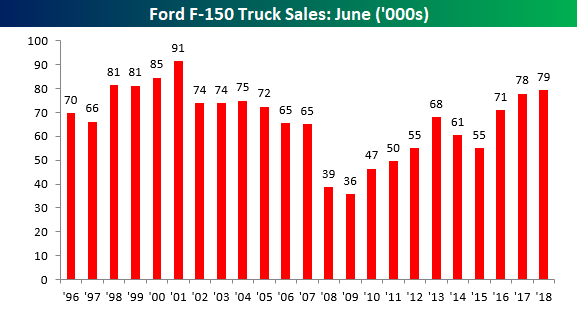 Trucks are often purchased by small businesses and contractors, so they provide a good read on the health of the small business sector, and similar to the prevailing narrative, Ford’s numbers suggest a solid US economy. For the month of June, total F-series sales increased 1.7% to 79,204. That’s the highest monthly reading for June since 2001 and the sixth highest June total since 1996. The above numbers aren’t adjusted for selling days, so overall totals for each month aren’t necessarily an apples to apples comparison. Looking at total sales for the first half, though, provides a more complete picture and based on these numbers, 2018 is one of the strongest ever. As shown in the chart below, total F-series sales for the first half ticked up to just over 451k, which narrowly eked out 1999 for the second highest total since 1996. The only other year where total sales were stronger in the first half was in 2000 (472,349).